I’ve started making my own dumpling skins. I started with white flour skins and now I’m making whole wheat skins. Now that I’ve made several batches of skins, the rolling and wrapping have become easier and faster. I prefer the whole wheat skin over the white flour skin because it is healthier and not as heavily processed. The whole wheat flour gives the skin a little bit of grit, similar to whole wheat bread. The instruction below is basically the same as the white flour skin, I’ve just updated the pictures. The recipe is the same as the white flour skin except more water is needed because the whole wheat flour is drier. Start by mixing the flour and salt in a large bowl and then carve out a well in the middle. In three phases, pour the just boiled water in a steady stream over the flour making sure to moisten the flour evenly. Use a wooden spoon to mix the water and flour mixture. The flour will turn into lumpy bits. Knead the dough in the bowl to try and get the lumps into one large mass. I have quite a bit of stragglers that don’t join the mass until I start kneading on my work surface. You can also add water a teaspoon at a time to get the mass more together in the bowl before transferring to the work surface. Be careful not to add too much water and make the dough sticky. Knead the dough for 2 minutes on your work surface until it is smooth and elastic. I like to use a Silpat to make the kneading process and cleanup easier. Place the dough in a zip-top bag, press all the air out, and let it rest for at least 15 minutes but no more then 2 hours. After the rest, cut the dough into 4 equal pieces. Roll each section into a 1-inch log, then cut into 8 equal pieces. If you like thin skins like me, 8 pieces makes big dumpling skins. If you like thin skins and not big dumplings, cut into 10 equal pieces. I personally like the big dumplings because I get to eat more filling, my favorite part! Shape each piece into a disc and then press each disc in a tortilla press or between small plates covered with plastic wrap or zip-top bags. The tortilla press would probably make the disc flatter which would make the rolling process easier, but the plates are a good alternative. Use a whole wheat floured rolling pin to roll out the discs even more. I like my skins thin so I roll mine out so they have just enough width to hold the filling. Holding the floured disc gently in the center, use the floured rolling pin to roll back and forth pressing out the edges. Please excuse my dry dumpling mama hands, flour brings out the worst in them. Rotate the disc until all edges are to your desired thickness. Now just a note about wrapping and cooking the homemade skin. The skin is more elastic then store-bought skin so you can if you want put a little extra filling in your dumpling. Since my fillings have a lot of vegetables in them, I like to stuff my dumplings. Leave a half inch between the filling and the edge of the skin. When you use homemade skin, you don’t need water or egg to seal your dumplings. To close the dumplings, press the front and back skin together and create a single pleat. Start with a middle pleat, then do two or three on each side and make sure the top is sealed completely. I line each dumpling up on a sheet pan lined with plastic wrap after I wrap them. I cook the number of dumplings I want to eat and then place the rest in the freezer to be eaten later. To make sure the dumplings do not stick to each other while frozen, freeze the dumplings for at least thirty minutes before placing them in a zip top bag. These dumplings are really big! This skin is really delicious. It’s the first time I’ve had whole wheat skin and I made it myself! It’s a little gritty, a little spongy, crispy when pan-fried, and whole wheat! Put the flour and salt into a bowl, mix together, and make a well in the middle. Use a wooden spoon to stir the flour while you add the water in a steady stream. Add the water in three phases to allow the flour to absorb the water. Try to evenly moisten the flour. The flour should turn into lumpy bits. Knead the dough in the bowl to bring all of the lumps into one mass. If the dough does not come together, add water by the teaspoon until it does. The dough should not be sticky. Transfer the dough to a hard work surface. I like to use a silpat. Knead the dough for 2 minutes until it is smooth and elastic. Seal the dough in a zip-top bag making sure to press out all air within the bag and let it rest for at least 15 minutes and up to 2 hours. The dough will steam up the bag and become soft and easy to work with. After the rest, cut the dough into 4 equal sections. Roll each section into a 1-inch thick log, then cut it into 8 equal pieces. Shape each piece into a rounded disc. Lightly flour the top and bottom of the disc. Use a tortilla press or two small plates covered in plastic wrap to flatten each dough disc. Use a floured rolling pin to roll out the disc even more. Holding the flattened disc gently, use a floured rolling pin to press out the outer edges of the disc. Roll back and fourth, continuing to rotate the disc until all edges have been pressed out to your desired thickness. 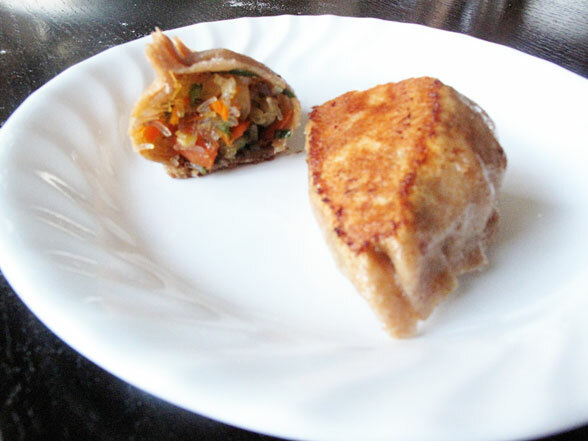 The dumpling skin cannot be too thin because it has to hold the filling without it breaking the skin. Add flour if necessary to keep the dough from sticking and tearing. 3 to 4 inch long skins will make 40 skins, 5 inch long skins will make 32 skins. Note: If you do not use the dough right away, refrigerate it overnight and return it to room temperature before using.